Are you looking forward to an early summer garden party? A barbecue with friends? 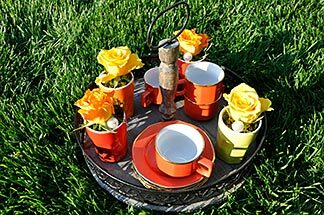 Roses can not only be used to make enchantingly beautiful table decorations, but also to conjure up fantastic refreshments and delicious treats. 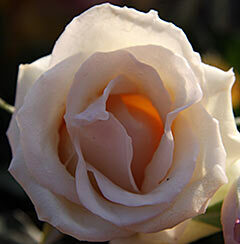 We will also show you how to enjoy your roses for the longest possible time. The ultimate romantic content for a glass vase! You're sure to have little containers in your cupboards that can be used for table decorations. Old pots made of clay, metal or ceramic material, coloured plastic beakers perhaps, or even espresso cups to match the crockery you use when your friends come round for a chat of an afternoon. 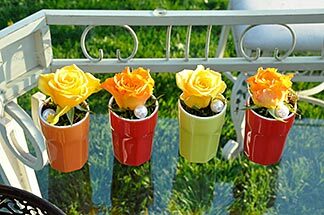 Fill them with floral foam, cover with moss, add water to the containers to soak the foam completely and put in a rose. These little creations not only look good in a row in the middle of the table, but are also a great way to place a warm welcome at every seating area. 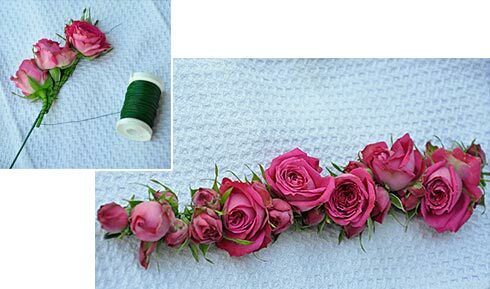 For enchanting napkin rings, take pieces of wire 20 cm long and 1.4-1.8 mm thick and plenty of little polyantha or floribunda rosebuds with stems of approx. 3 cm. 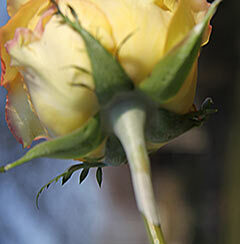 Attach the rosebud stems to the "thick" piece of wire with winding wire or strong thread. The buds should overlap so that one bud covers the stem of the one attached before it (just like when you use twigs to make an Advent wreath). Finally, bend the "rosebud stick" to form a ring, or rather a napkin ring. If you then tie a nameplate to a satin ribbon approx. 40 cm in length, pull the ribbon loosely through the ring leaving an end of around 20 cm, and the serviette rings double as impressive place markers. We're experts in enchanting guests too. You'll find our ready-made highlights HERE. 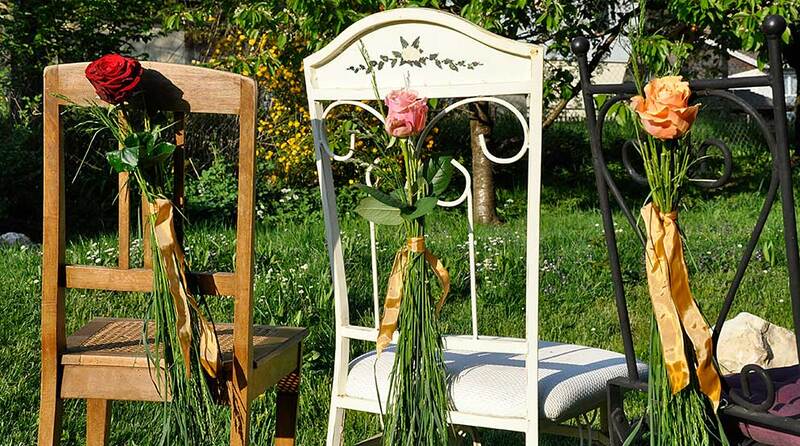 At open-air summer parties, you can also give the chair backs a summery touch. 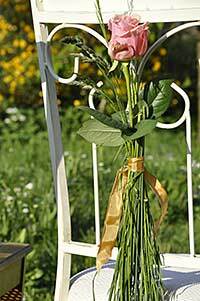 Simply wrap water-filled test tubes containing a rose (or other flower) with grass and ribbons and tie the arrangement to the chair back. 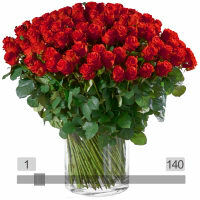 Would you rather have your roses in a vase? 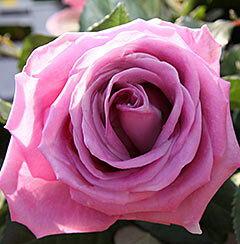 You'll find the ideal selection of rosy ideas HERE. Whether for a tête-à-tête with your beloved or an atmospheric party among friends: when day turns to dusk, the hour of rose-decorated storm lanterns has arrived. Take a glass vase. Depending on its size, place one or more candles inside it and shower rose petals over them so as to cover the bottom of the vase. This idea is simple but very effective. 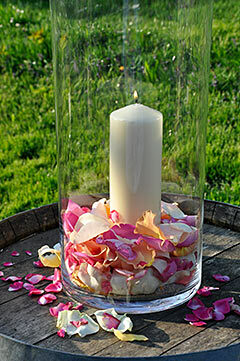 You can also combine the storm lantern (glass vase with candle) with a romantic wreath of roses. 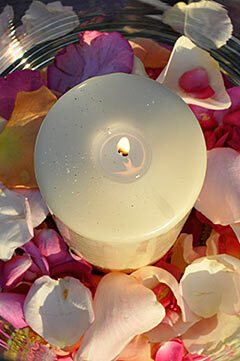 Cover a ring of soaked floral foam densely with rose blossoms and lady's mantle and place a glass vase with a candle in the middle. For a third version, place a drinking glass inside a vase. Fill the space between vase and glass with rose petals and lady's mantle … and place either a candle, a summery bouquet or a garden rose in full bloom in the glass. - The glass vases offered by Fleurop are perfect for such projects. 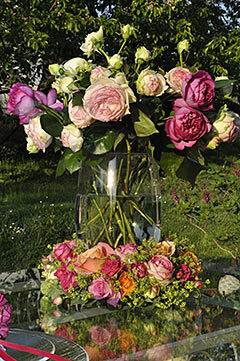 You can buy them from any Fleurop florist or order them from www.fleurop.ch - together with a summery floral dream. 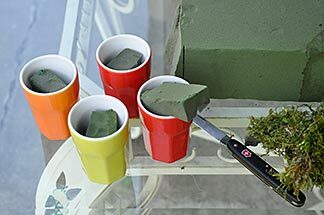 You've planned a party but don't have time for any do-it-yourself? Or you've been invited to friends and would like to send a "thank you for the invitation"? 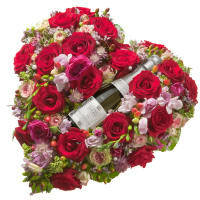 You can also simply order enchanting bouquets - with or without a vase - from the professionals. The shop is HERE … with plenty of inspiration. Do you recall the garden roses of a memorable summer? A rose you were given by someone very special? Or simply a desire for roses … even in winter? In that case, you should try preserving them. Methods include wax coating or drying. To wax roses, first buy dipping wax for flowers. Heat it in a bain marie, then allow it to cool until the surface forms streaks. Dip the rose(s) and at least 3 cm of stem into the wax using a rotating movement and then draw them out, again with a rotating movement. The wax has to cover the petals completely to prevent them from going bad later. Be careful when drying the roses to make sure the wax doesn't break. - Tips: white and yellow are tricky colours. Their petals can easily turn brown if the wax bath is even slightly too warm. It is best to test it using a single petal. 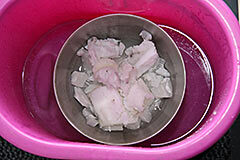 It is also important to dip the flowers in the wax no more than once, otherwise unsightly caking occurs. 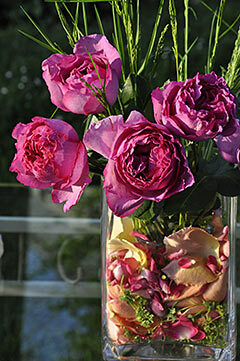 To dry roses, you need a dry room in which the air can circulate. 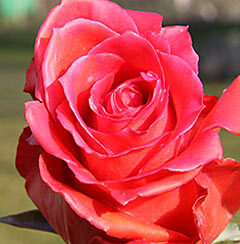 Wash the stems of the roses thoroughly before the drying process and dry them well to make sure they do not rot. Then hang the individual roses head down (important! 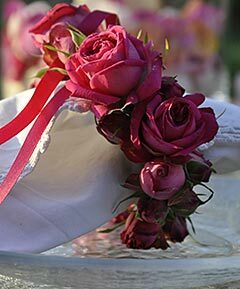 ), or bind roses tightly into a bouquet with a rubber band and hang them upside down. 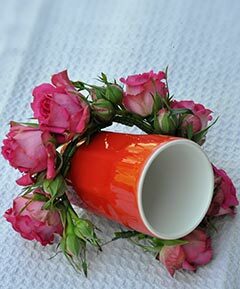 - Tip: after drying, you can not only place the roses in a vase or distribute them in decorative fashion, but also make an arrangement with them using a ring of floral foam, for example. This makes a good decoration for a door, wall or table and will still be beautiful during the winter. Roses for waxing or drying, or simply for putting in a vase, can be found HERE. Roses are highly versatile. They're elegant and represent love. They are also a gourmet's delight. So why not make a rose cocktail for Valentine's Day? Here's the recipe. Ingredients for 4 servings: 1 bottle sparkling wine, e. g. WHITE Secco, 4 tbsp Monin rose syrup, 4 tbsp Amaretto and freshly pressed orange juice. 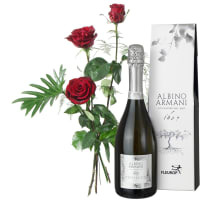 - Method: place 1 tbsp rose syrup and 1 tbsp Amaretto in each sparkling wine glass then fill up with half orange juice and half sparkling wine. Stir briefly. 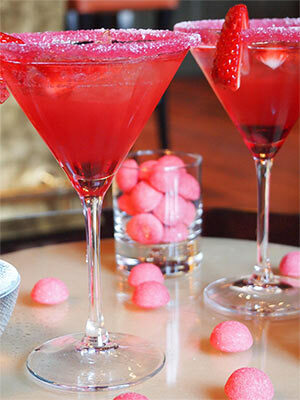 - Tip: arrange the cocktail glass on a plate with a beautiful rose petal for a particularly elegant look. 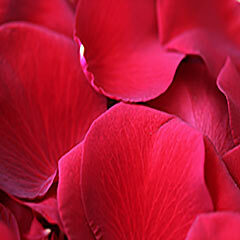 Do you need roses or rose petals for decoration? You'll find roses HERE. 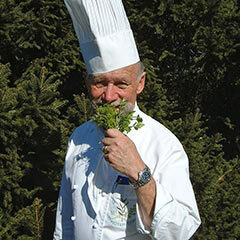 Famous stars of Swiss gastronomy also cook with flowers. 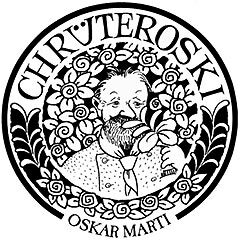 That includes Oskar Mari, aka "Chrüter-Oski". He almost goes into raptures on the subject of roses, because to him they are "like beautiful women". What are beautiful women like, we want to know. And again he's enraptured. "Exciting, fascinating, and ever-changing," he says. "That's why I have all kinds of varieties of roses growing in my garden. And they have very different flavours as well. English roses, for example, are mostly sweet, with the exception of Mister Lincoln which has a strong scent and is very spicy." Here is Oskar Marti's recipe for an early summer rose yoghurt sorbet. 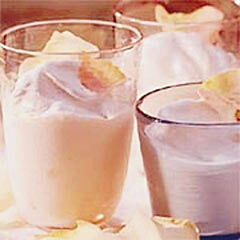 Ingredients for 4 servings: 70 cl rose syrup, 30 cl yoghurt, 1 scented rose petal. - Method: mix the rose syrup and yoghurt; remove the bitter, white base from the petal and chop it coarsely; add it to the rose syrup/yoghurt mixture and freeze in an ice-cream maker. - Tip: before serving, Oskar Marti allows the sorbet to thaw a little and then garnishes it with a beautiful rose (or a handful of rose petals). You'll find more exciting rose recipes in Oskar Marti's books "Sommer in der Küche" ("Summer in the Kitchen") and "Likör, Bowle, Sirup" ("Liqueur, punch, syrup"), which are available in German online and in bookshops. You need a table decoration to go with it? The shop is HERE.